I wonder if there is any left!!! 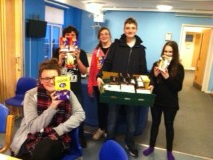 The trustees enjoyed handing over 60 Easter Eggs to Young Carers this week when they attended one of the Group Sessions at the Castlegate Centre in Donnington, Newbury. We have been busy preparing for our 2nd Annual Easter Bake sale. See separate post.